WHITHER the POINTS you've gotten? Have they disappeared into the abyss? NO MORE! Now your POINTS can last FOREVER! The latest entry in the long-running WATCH DUCKS series, WATCH DUCKS LEGACY keeps your points and allows you to keep them on for eternity. New bonuses and secrets abound! First new WATCH DUCKS game in five years! Auto-save feature keeps every point you get! Retains gold and silver duck enhancements from Watch Ducks II! 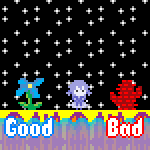 New two-color sprites and higher resolution (240x200)! Press F4 to toggle fullscreen! Press F to change window resolution! Press Q to quit! 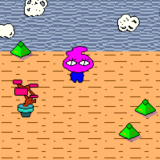 Please enjoy this very late entry to the anniversary celebration, a sequel to the very first game I submitted to the site! The addition of score continuity makes me compelled to leave this game open at all times more than any prior entry in the Watch Ducks franchise. 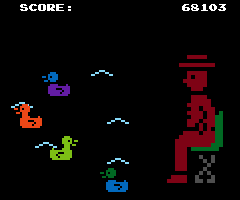 EDIT: this game gets a 10/10 for getting me to do an image search for "mandarin duck". Thank you! I hope you enjoy all your POINTS.